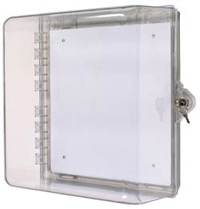 Approximate internal dimensions: 12" X 14" X 6.37"
Polycarbonate rated -40°F to 120°F (-40°C to 49°C). Lifetime guarantee against breakage of polycarbonate within normal use. Additional eyelet can be used for secondary safety seal. External mounting tabs or internal drill dimples. Complete with mounting hardware and gasket. Design allows visibility at any angle. Cover includes a white steel internal mounting plate with a baked on enamel finish. Multipurpose cabinet for units that require physical or environmental protection. Helps guard against vandalism (accidental or intentional), as well as dirt, dust and grime. Cover mounts on the wall enabling the unit to be stored in a central location. The cabinet is available with a key lock, which helps deter wrongful users away from the unit and has an additional eyelet for a secondary safety seal. Cabinet consists of a clear polycarbonate that allows the unit within to be highly visible and accessible. The external mounting tabs enables the unit to be easily installed on any wall.